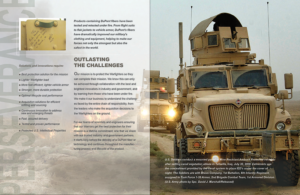 Challenge: Effectively market protection products under the DuPont brand to military and defense industry partners. While the product brands Kevlar and Nomex were strong ones, issues around delivery and timing had created some potentially negative perceptions among audiences. The size and strength of DuPont were also challenges given the immediacy for both product supply and response time. Solution: TWP developed a marketing and communications plan that included strategies and specific messaging to create awareness and collaboration among military, research and development, and value chain audiences. These audiences required very different approaches and communications. TWP created a new look and theme for the division that tied back into DuPont brand standards. 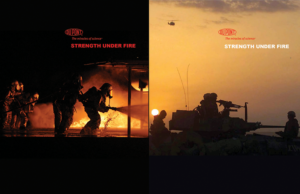 The theme Strength Under Fire unified both the Kevlar and Nomex products and protective fabrics under one theme and served as the creative platform for development. 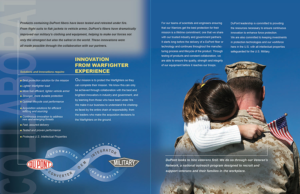 Result: Clear messaging, promotional materials, and market intelligence was provided to the entire military protection team, which served to unify sales, marketing, and communications. Strategies were shifted with less “selling to the military” and more time spent on teaming, research, and development. Targeted strategies resulted in time and resources saved, with a more streamlined approach to marketing.